Irving Penn gets gum all over his couture camera in new exhibit. Irving Penn’s newly minted show in the Modern Wing of the Art Institute, Underfoot, exhibits a series of photographs he made about a decade ago in New York City. Don’t immediately look at the museum introduction tag. Instead, go right into the photos and see if you can determine what they depict at first glance. Spoiler alert: They are chewed up pieces of gum, cigarette butts, and muddy gloves. If you think, even for a moment, that they are stars, gigantic mountains, or other sublime things, then you quite likely hit the nail on the head, though by accident. It’s a mistake that Penn intended for you to make. After all, to photograph the seedy and to spin from it the divine is Underfoot’s purpose. Irving Penn is a name that sounds most familiar to the fashion-conscious. Beginning in the 1940s, his career became defined by his photographic work for Vogue. In the ’50s he founded his own studio in New York and began creating photographic fashion ads. Both Issey Miyake and Clinique appear on his client list. However, while his sense of poise and elegance was suited to the squeaky-clean fashion industry, his obsession with exposing the dirty and the soiled went largely unsatisfied. Between 1949 and 1950, Penn began undertaking photographic projects of his own. His fixation on the neglected or even the distasteful surfaced quite early in his role as an independent photographer. His first MoMA exhibition was called Photographs of Cigarettes, and his ensuing show at the Met was Street Materials. His 1989 exhibition at Pace Gallery, titled Other Ways of Being, sharply sums up his interests. It is almost as if Penn became so disenchanted with the glamour of high fashion that he sought out its antithesis: the gloomy, the dirty, and the lowly. But, of course, the dirty business is handled in a sly way. And that is why one should view the photograph first, and then look at the tag. Penn treated the pebbled, gum-spattered street of New York as a ready-made canvas. 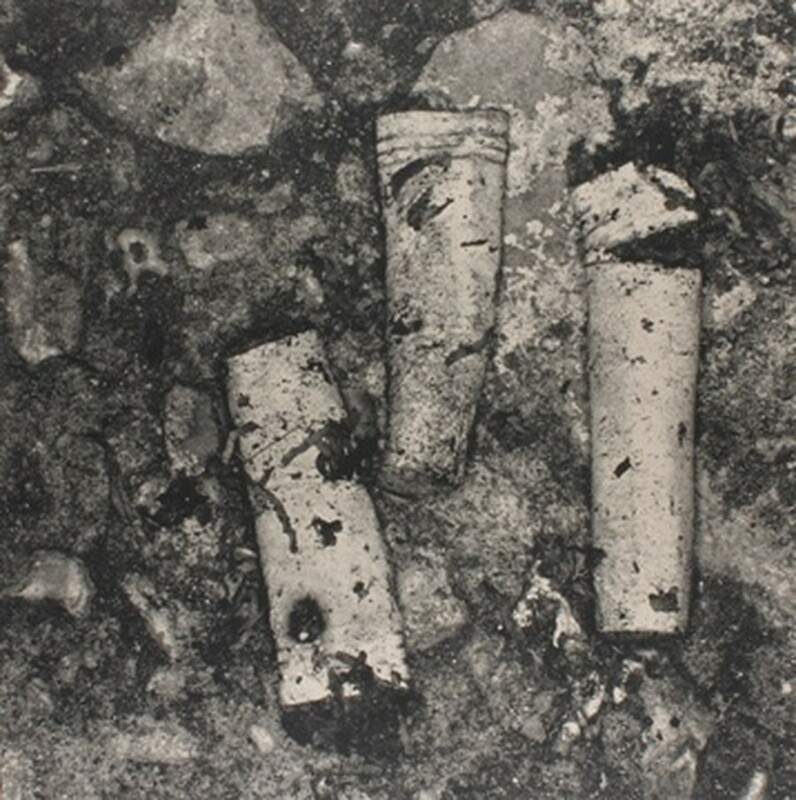 With a medium-format camera fitted with tubes that extended his lens nearly to the ground, he carefully captured the objects discarded on the filthy pavement. The tag does not address his editing procedures, but he certainly manipulated the color and the scale to such an extent that those discarded objects no longer read as themselves. A fleshy, coiled-up wad of gum looks like a fetus. Another stone-shaped wad of gum lying against a completely black background looks like stars. A glove covered with mud and other vegetation looks like a bare mountain. It is almost as if Penn is trying to weave two lines of thought into these images: what the object is and what the object means. It is gum, but it is meant as a cosmos/fetus/fill-in-the-blank for wherever your imagination takes you. And even if it is not clear what the object resembles or what the object actually is, a calming, meditative air seems to descend upon it regardless. Penn’s Underfoot project certainly has a magnetic quality to it. Behold the detested turning into the desired! Or even better, the philosophical—but I doubt Penn has put that much rigor into the concept behind it all. The project seems to me largely carried out by instinct, and as I walked through the gallery, the works appear to be more and more repetitive, even stagnant. Of course, Penn has weaved nuances and differences into every single piece—he carries out the project with a perfectionist temperament befitting a Vogue photographer—but this project would not be hurt if he took out two or three photographs. I subscribe to the notion that in a good painting, or a good project, you cannot take out even one element—every element, as small as it may be, plays a great role. This is probably what is lacking in Penn’s work: It has a central idea that motivates the project, but the project does not build up momentum work by work. When I exit the gallery, I think to myself, “This project is really nice,” which is not necessarily a compliment for an artist. After all, many artists want the viewer to walk out of the gallery shaken.